We can show the expenditure multiplier graphically using the income-expenditure model. 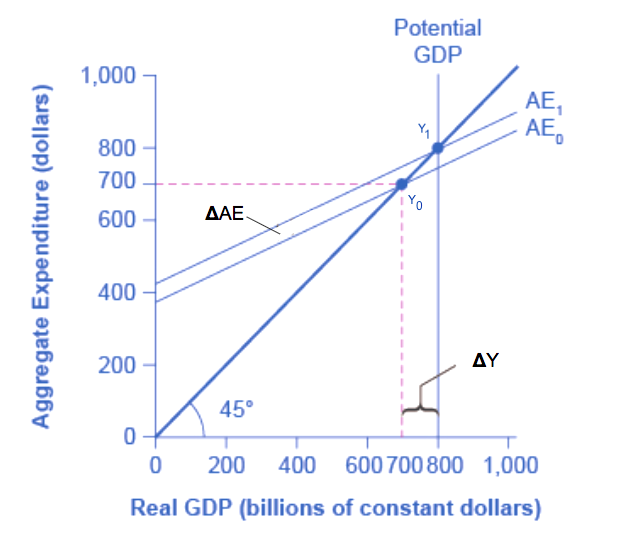 The original level of aggregate expenditure is shown by the AE0 line and yields an equilibrium level of GDP at Y0. Consider an increase in AE to AE1, which is shown by a parallel shift in the AE line. The vertical distance between the two AE lines is the increase in aggregate expenditure. The new equilibrium level of GDP occurs at Y1. It should be clear that the increase in GDP from Y0 to Y1 is greater than the increase in expenditure from AE0 to AE1. The spending multiplier is defined as the ratio of the change in GDP (ΔY) to the change in autonomous expenditure (ΔAE). Since the change in GDP is greater change in AE, the multiplier is greater than one. Suppose the equilibrium level of GDP is $700 billion. If government spending increases by $50 billion, GDP rises from is $700 billion (at Y0) to Y1 $800 billion (at Y1). Thus, the change in GDP is $800 – $700 = $100 billion. In this example, the multiplier would be $100/$50 = 2. Figure 1. The Multiplier Effect in the Expenditure-Output Model. The power of the multiplier effect is that an increase in expenditure has a larger increase on the equilibrium output. The increase in expenditure is the vertical increase from AE0 to AE1. However, the increase in equilibrium output, shown on the horizontal axis, is clearly larger. Thus, the spending multiplier, ΔY/ΔAE, is greater than one.